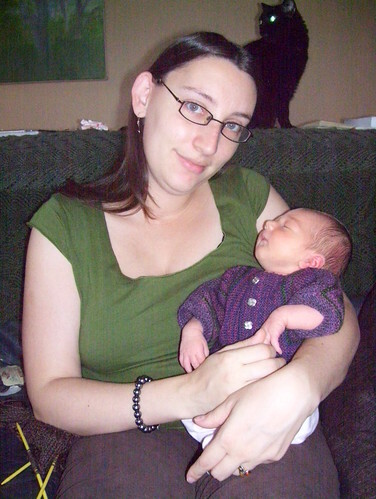 It almost seems like one would have her “Knitter” status revoked if one was pregnant and did not knit this ubiquitous cardigan. It’s ok by my, though, since I love reading Elizabeth Zimmerman, and this particular pattern manages to be dead-simple and not ‘mindless’ at the same time. It’s also like the origami of knitwear — it’s fun to blindly knit along and not know how it will work out and then just twist the needles and see a glimpse of it all! 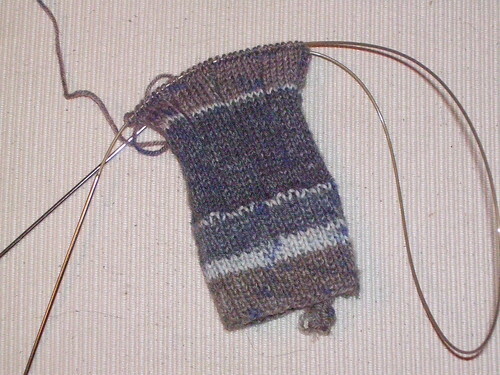 For those times that a simple sweater and/or garter stitch are still too complex… a boring ol’ sock. But it’s Austermann yarn “mit aloe vera“, which is pretty nice! And yes, sometimes I still can be sucked in by the novelty of yarn that stripes itself. Unfinished: the nursery / baby ‘gear’. I took a photo, but it’s just so overwhelming I can’t bring myself to upload it. 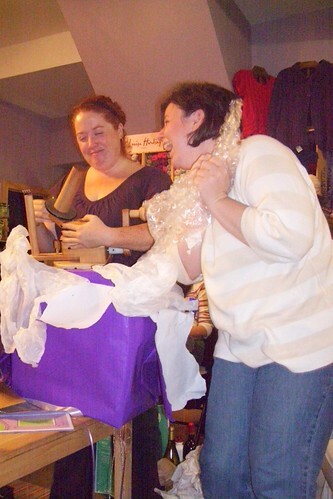 There are many things that need to be not-in-there (some stuff that just needs to be trashed, and unfortunately more that need–ugh–organizing), a tonne of baby-shower gifts that need to find their new permanent homes (my gods, how many onsies does one baby need? I don’t think I’ll get to buy this baby any clothes until it’s a toddler! ), and some critical pieces (crib? diaper pail?) that don’t even exist in this current reality. And let’s not even talk about all those moms-to-be with their designer diaper bags and a month’s worth of meals in the freezer. Because that must be a myth, right? I’m beginning to find myself entering the ‘countdown’ phase, the point of no return looming close and feeling up to the challenge! (“Stuff” notwithstanding.) I know that there could be many more weeks before this little one decides it’s time to join us in the world, but I also can tell that my body is beginning to prepare for that transitional journey. Finished: Work for 1 year. Maternity leave has begun as of Monday. Most people consider this “early” (by which I mean I’m not due this week or anything), but I’m thinking about it as “on time” (by which I mean I think this is exactly the right time for me). Recognizing that I am an incredibly privileged woman with a strong job/union, an understanding work environment (which recognizes it’s stress levels), and a supportive partner, I am very grateful and glad that I can take this time in these last weeks before birth. While I have only got uncomfortable symptoms and no complications in this pregnancy, I still want to be both as strong as I can (mentally and physically) for the birth, and to have the healthiest baby I can grow. I plan on doing a lot of resting, a little bit of frivolity (High Tea, anyone? ), and a huge amount of organizing/cleaning/prep work. That’s right folks. I have been KNITTING. And now it is done!!! This sweater is a huge accomplishment for me! 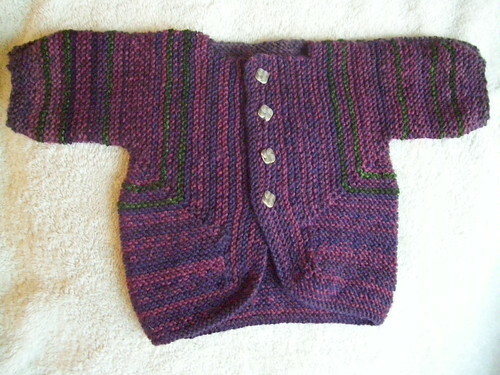 First off, you should know that this really is the first sweater I’ve ever knit for myself that has turned out at all. One has been utter crap, the other, gorgeous as it was, once washed was destined to never go on my body (oh Gatsby Girl, how I miss you!). 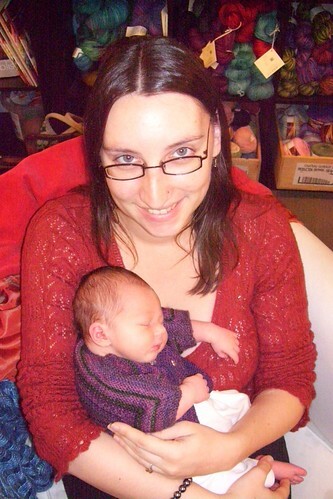 I knit a sweater for my sister that was an atrocity. I knit an aran sweater for my father that turned out quite well (about a year late, though). Really, Dru’s Cobblestone is about the only sweater that’s been knit in a timely fashion and has turned out well — until now! 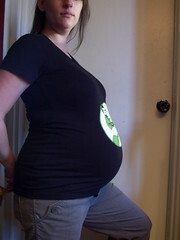 I think that, pregnant or not, 2 months is a respectable time-frame for a larger project. 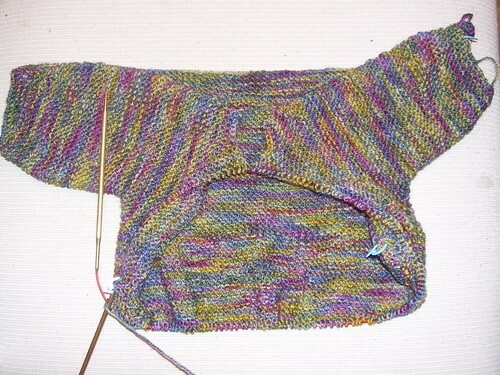 I definitely think that the Addis helped speed things along, too :) Mostly because this was the first time I tried knitting both sleeves at once along the circs, which ensured that the sleeves were both symmetrical and both finished at the same time. 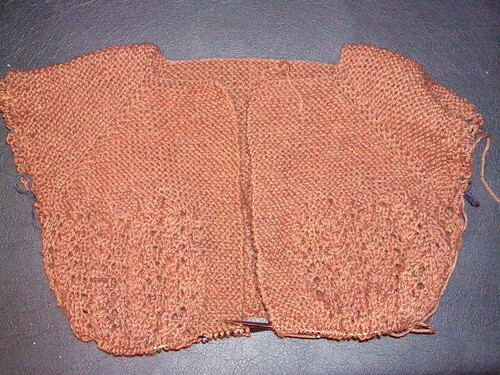 I also knit the sleeves before I started the ‘skirt’ portion, so once that was done all I had to do was the collar and the sewing. It might be a mental trick, but it worked: the project seemed to go at a good pace. There are a few issues with this sweater, don’t get me wrong: the armscye is way strange (something I could ‘fix’ if it were sewing, but will just have to keep in mind for further knitted garments), the fronts are a bit small and the back a bit large, and the sleeves came out a bit long. But it fits pretty well overall, and I like having sleeves that can cover my wrists well! The only modification I’ve made has been to add a small hook-and-eye closure where the two angles of the front come together, to keep things neat. Best of all, it really is the perfect maternity sweater to show of the baby-belly! Hey folks, it’s time once again for Knitty.com to release a new issue! Knitty has been even further improved by what looks like even more patterns than they usually give out, and now, all of them come with a “printer friendy” button — no more reformatting in Word, yay! 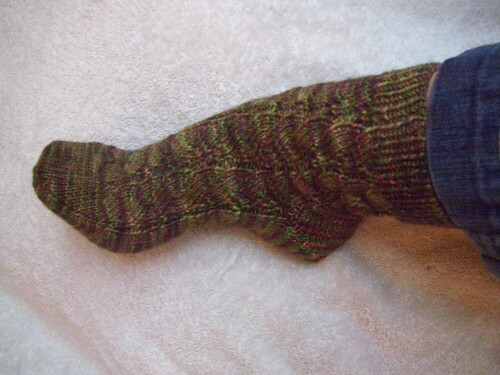 I haven’t shown him yet, but I know Dru is going to want me to knit him the Mangyle. For me? I just want a Nightcap! 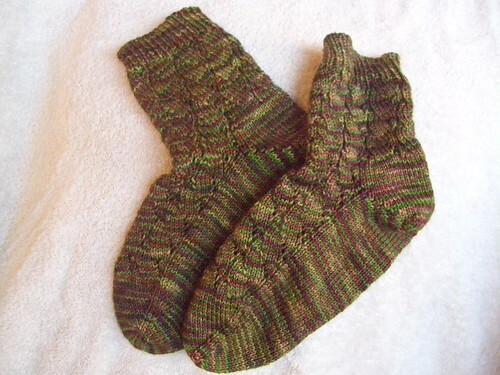 And also a pair of lovely hand-knit socks for me!! 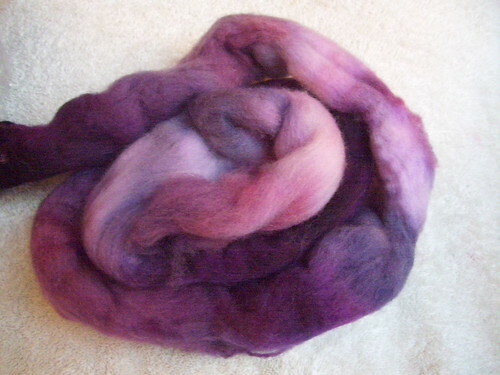 She also sent me some wonderful purple Polworth roving to spin (and I’m even getting that wheel-spinning bug, these days!). And a handmade beaded DPN-holder! I feel lucky to have been paired with such a generous pal. I have never been the recipient of so much of someone else’s creative energy, and am very grateful of these beautiful things. I’m sure I (and my baby) will love them for years to come! Next time… I have been KNITTING!! 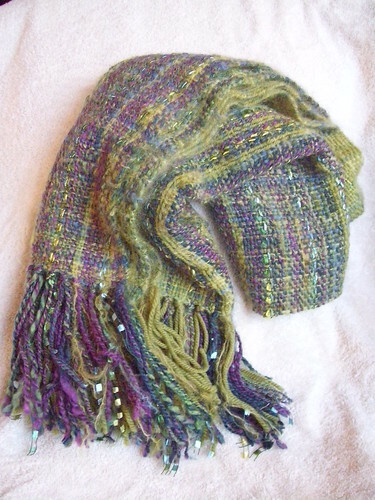 That great pattern published in IK Fall 2006 by my talented knitter/artist friend Jodi Green? That sweater I had to reknit the sleeves about 75 times (or so)? That little feminine number that looked oh-so good when I first tried it on? Well, after several months balled up at the back of my wardrobe, the pendulum of it’s fate vacillating between ripping it out or consigning it to an oubliette for eternity, a glimmer of hope emerged. It may not fit me, but perhaps it would fit someone, right? I invested too much good knitting to have it go to nought. So the other night I threw it into my bag as I headed over to the PP. Turns out that I knit Gatsby Girl in the perfect size, for Jennifer at least! I still love that sweater. It makes me very happy that now, someone else can too!